First and foremost I want to thank everyone for the prayers and well wishes concerning Bob. They were sooo apppreciated! He is home now.....and all seems to be well. I guess it was just the meanness coming outta him!! They kept him for observation and then he underwent tons of tests yesterday AM. They were looking for heart issues or a blood clot and found neither so that is good news!!! However we still don't know what caused his pain. One of lifes great mysteries I guess. But I am very relieved he is healthy even if he is still grumbling at me for making him go in the first place. He'll get over it!!! Friday it all comes to a head with Field day!!! Then next week is the Kindergartener's "Mother's Day Tea" it is such a sweet event......the kids treat their mom's to lunch, sing for us and we get the royal treatment. Yeah.....there will be pix for that event as well.....lol. Also next week Is The 4rth grade field trip to see the Tennessee Smokies baseball team in action. (minor league team) and My 14 year old has his NJROTC banquet and he gets his new rank since he passed his promotion test!!!...WOOOOT!!! And we think he has about 10 ribbons coming for his uniform. More WOOOTS!!!!! And I know there is more.....I just don't have it in front of me ....lol. Well, I spent a couple of hours today playing along with the Design Dollies Tuesday Element challenge. I love those dolls to death but they made this one TOUGH!!! I was talkin a little smack over there so I figured I'd better put up or shut up :) So I did indeed tackle the element challenge!!! And I am pretty darned happy with what I came up with too. This was my first time ever making a tag and and I could easily get hooked on this! I am feelin a tag album in the not so distant future!!!! Right off the bat I was concerned with red ribbon and anything lime green.......lol. But me, being the true professional I am, (Professional WHAT......not so sure......lol) got r done baby!!!! The photo is Jesse earlier this school year with his little armload of awards from school....soooo adorable!!! Even with his little cookie moustache.......lol. Ok....now why did that turn sideways??? Blogger must be having that "not so fresh feeling" again....ugh!!!! But you can see I have one also placed behind the photo.....I love this one!!! And it was a lot of fun to make! 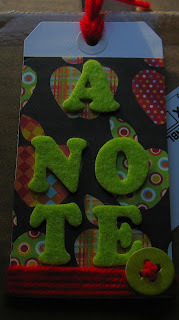 And you can obviously see the only red ribbon I have on the house, red yarn :) And I have lime green letters spelling out A NOTE as well as lime green in a couple of the papers. The flip side has my uncolored stamped image and I am going to use it for some journaling. Cute huh? I am still sitting on my other good news until I have the AOK and it's official....it's killing me......LOL. I'm outta here............gonna try to wrap up some email and work on a couple of things until I'm ready to crawl into bed. I love cookie crumb smiles too!! 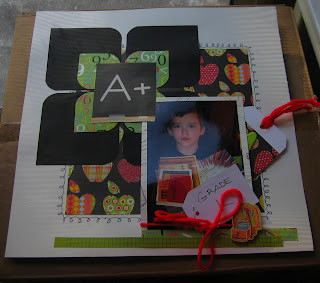 :) :) Very cute layout...you totally made lime and red work! "Not so fresh feeling"...bwahaahahaa!! Girl, you crack me up. Can't wait to see what kind of loot you end up scoring at the yard sale. Girl... you crack me up every time I visit!! You have one busy schedule coming up with all the end of the year activities!! Just be glad they are getting out so early... we are in until June 7th because of all our snow days this year! Enough already!! Anyway, back on topic... love the LO!! You pulled together the color combo so well and I love the creative uses of the tags!! This one is a winner!! I love the LO too! love the happy day along the bottom of your blog- so much fun! I enjoyed browsing your blog and I look forward to seeing your work! Now how did I miss this one?? Super cute!!! Love the PP and design you used on this one, Tina!! And the cookie moustache is too funny!!! Did you do the swirly doodling by hand? It's fantastic!!! You are very talented, I just love the layout, love how you have perfectly placed those gorgeous embellies, and the tag just gorgeous too, you rocked it my girl. WOW! That LO is amazin! Love all the super elements! Thanks for playin with us Dollies!